Hanoi (VNA) - The State Bank of Vietnam (SBV) is adjusting for the second time the roadmap to apply the maximum ratio of short-term funds used for medium- and long-term loans. According to a new draft circular to revise Circular No 36/2014/TT-NHNN on regulating prudential ratios for credit institutions and foreign bank branches, the maximum ratio of short-term funds used for medium- and long-term loans will be at 45 percent in 2018 and 40 percent in 2019. This is the second time the roadmap for the ratio is being revised. The first amendments to the circular were made in May last year with the ratio reduced from 60 percent in 2016 to 50 percent from January 1, 2017 to December 31, 2017. It will drop to 40 percent from the beginning of 2018. The SBV said the second adjustment is based on its assessment and scrutiny of the country’s economic indicators in the first months of 2017 as well as the Government’s macroeconomic regulation direction in the last months of the year. The new draft circular has been made public on the SBV’s website for recommendations. Earlier, during a regular Government meeting in May, Prime Minister Nguyen Xuan Phuc issued a resolution in which he directed the SBV to consider and adjust expansion of the credit limit for medium- and long-term loans of credit institutions. The Government has also affirmed that the capital adequacy ratios applied for credit institutions and foreign bank branches that participate in programmes and projects under the Government’s instruction will be different from the average ratio. For example, for the lending programme on encouraging development of the hi-tech agriculture industry, Deputy Prime Minister Vuong Dinh Hue has asked the SBV to consider the proposal of commercial banks to not include medium- and long-term loans for the programme in the maximum ratio of short-term funds used for medium- and long-term loans mentioned above. 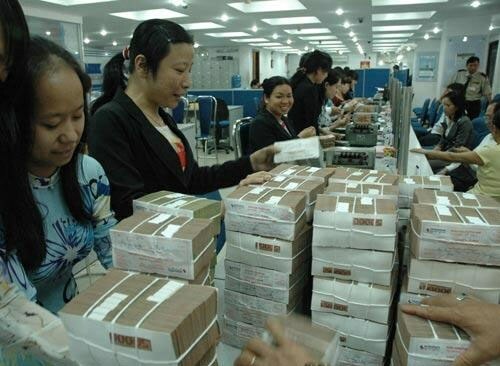 According to the SBV, the medium and long-term capital source should be supplied via the securities channel, but in Vietnam, this source of capital is still mainly mobilised via the banking channel. The SBV’s statistics revealed that medium and long-term loans still account for 53-55 percent of the total loans, while medium- and long-term mobilised capital is only 13-15 percent of total mobilised capital.